Georgetowne is an active lifestyle community located in Edmond, Oklahoma. 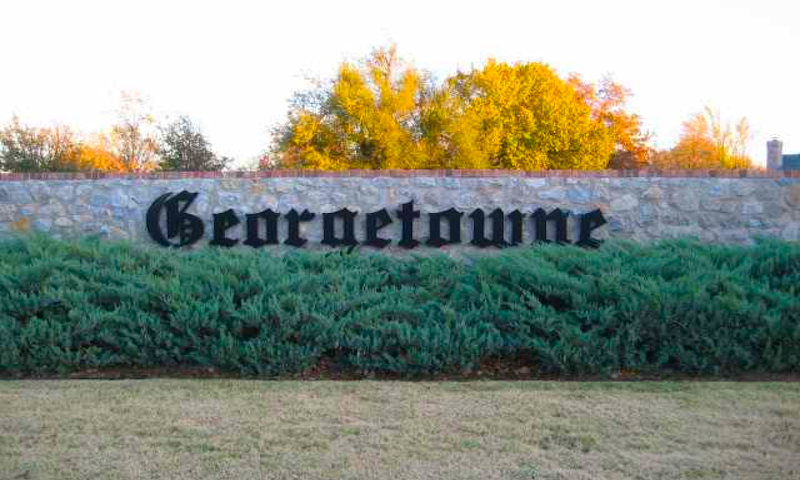 Georgetowne is a gated community that allows for secluded and private living. The community offers spacious homes with private backyards and green space. Its ideal location in Edmond, near Oklahoma City, means homeowners have access to both suburban and urban environments. Georgetowne is a gated community, offering privacy fences and acting as an oasis for the world around. Its seclusion make Georgetowne a quaint, quiet community and offers an escape from the bustling suburbs. The community features a park that has trees and ample amounts of green space. Georgetowne is also well-manicured, eco-friendly, and is very walkable. The Homeowners Association (HOA) fee helps provide residents with a low-maintenance lifestyle by taking care of yard and common room maintenance, as well as providing gated access to the community. Construction of Georgetowne began in 2006. Now completed, the community includes 40 homes. These homes come in floor plans ranging from 2,028 to 3,048 square feet of living space. They have two to four bedrooms, one to three bathrooms, and two or three-car garages. These homes include features like open floor plans, modern kitchens, and private backyards. Conveniently located just north of Oklahoma City, Georgetowne gives homeowners great shopping and culinary options just minutes from their home as well as big-city amenities nearby. Just a few minutes from Georgetowne are shopping centers featuring a Walmart, The Home Depot, and Target. There’s also Chipotle, Panera Bread, and Chick-fil-A nearby. Homeowners will also have easy access to various parks and green spaces, including EC Hafer Park and Spring Creek Park, as well as Arcadia Lake. Golfers will have the option of utilizing Kickingbird Golf Club, The Golf Club of Edmond, and Silverhorn Golf Club. There are many health centers and hospitals just a few minutes away from Georgetowne, including Integris Family Care, OU Medical Center – Edmond, Edmund Urgent Care, and many more. Georgetowne is conveniently located between Route 77 and Interstate 25, both leading to Oklahoma City, which is just 20 minutes away. There, residents will find almost limitless entertainment like the Oklahoma City Zoo, NBA games at Chesapeake Arena, and the Oklahoma State Fair. The Oklahoma City Museum of Art and Science Museum Oklahoma are two of the biggest museums in the city. Visitors can also enjoy a concert at the Civic Center Music Hall. All this makes Georgetowne an ideal active lifestyle community in Edmond, OK. Check back soon for more information on the lifestyle in Georgetowne. These homes come in floor plans ranging from 2,028 to 3,048 square feet of living space. They have two to four bedrooms, one to three bathrooms, and two or three-car garages. These homes include features like open floor plans, modern kitchens, and private backyards. Please Note: Floor plans are not available at this time. 55places.com is not affiliated with the developer(s) or homeowners association of Georgetowne. The information you submit is distributed to a 55places.com Partner Agent, who is a licensed real estate agent. The information regarding Georgetowne has not been verified or approved by the developer or homeowners association. Please verify all information prior to purchasing. 55places.com is not responsible for any errors regarding the information displayed on this website.